Parchment Copy will 1 sheet 65cm x 40cm. 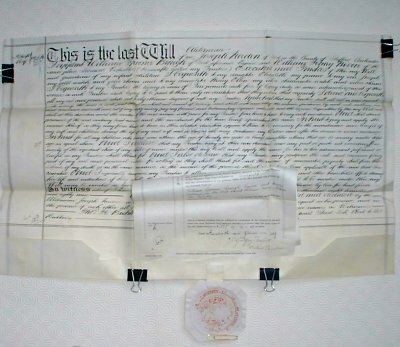 Probate 20/6/1889 1 sheet 25cm x 30cm with pendant seal. Alderman Joseph NADEN of Leek, Staffordshire. Contractor. William Henry NIXON of Leek, Staffordshire. Licensed Victualler. William Spooner BROUGH, of Leek, Staffordshire. Esquire. The will and probate of Alderman Joseph Naden.